In some ways, some critics were wrong, when they said the iPad offers little to creative people who make things as opposed to merely consuming them, as proven by all the innovative recording and sonic fingerpainting apps we’ve seen, among many others. However, when it comes to building apps and programming other software, the iPad appears to be completely hamstrung by Apple’s rules. As a result, any dreams you might have had of assembling an iPad app by dragging around modules and entering code on the iPad itself remain out of reach. This is perhaps the clearest sign yet that iOS devices are not computers in the traditional sense, and actually represent a step back for personal computing. By comparison, scientists want to build nanotechnology robots that can replicate another generation of nanotechnology robots. That way, they can scale. However, it is precisely this feature that Apple appears to have blocked in its most innovative new devices. I’ve heard more than a few developers attempting to create similar tools for the iPad, but all of them have hit various roadblocks in the Apple approval process because they all (in one way or another) allowed you to get code and assets onto the device and execute it. Codify sidesteps this by coming with a wide variety of assets, but unfortunately all of your creations will be trapped on your own device. Right now, there’s no way to export (or import) anything, although Two Lives Left have told us they’ve submitted an update to Apple that has this functionality and they’re planning on working with the approval teams to come to some kind of solution. “Interesting. Add social sharing of code,” writes John Bond. “I agree that there needs to be a social sharing component to this… The ability to share small projects would be awesome. I also don’t see a way to “compile” these projects into something useful or export them so that I can compile them on a desktop. Is there a process whereby I can do this to produce apps?” adds Scott Fitzhugh. Evolver.fm asked Apple about six hours ago whether it has any comment on its policy of hobbling apps that let you write code, and have yet to hear back (this is normal). But it’s good news that developer Two Lives Left is reportedly working with Apple’s approval team to figure something out. Let’s hope they do, because the iPad actually looks like a pretty decent development tool in the above Codify demonstration (or at least it looks that way to a former English major whose last programming language was BASIC). lol, I am sure that was done with good reason lol. I’m pretty sure Apple has never actually called them a computer. Confused consumers call them computers, Microsoft tries to call it a computer, but never Apple. Make no mistake, the iPad is a computer. We may classify it in some other ways as well, however, the definition of a computer is pretty basic and the iPad qualifies. Perhaps there are a few confused blog commenters who believe otherwise. Reading a dictionary may help with your classification issues. use http://snappii.com to make an app, it doesn’t even require programming skills. this platform is stuffed with so many features, that your app could look so very cool! Do you think the main reason the creators made this an iPad app rather than say, an HTML5 app available on the open web was any of the following? it’s easier to get media attention for iPad/iOS apps? Just thinking out loud. Hey, you do pretty good for a “former English major whose last programming language was BASIC.”! Apps can’t download code to be executed primarily as a safety precaution; if all code that will be executed on the device has been reviewed as part of Apple’s approval process, odds are very slight that apps from the App Store will contain anything malicious. This restriction, along with strick app sandboxing (limiting apps to only writing and reading data they create, not that of other apps), does an excellent job of ensuring there are no viruses or other malware on iOS devices. Unfortunately it also produces limitations like this one. 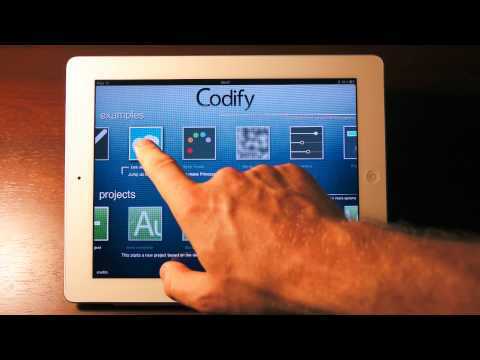 Check out Coders, similar app to Codify. It features code sharing via email. Codify should be allowed to provide similar sharing mechanism. The iPad is a computer – not a general purpose computer in the classic sense – an appliance computer. The concept off an Apple all-in-one appliance computer goes all the way back to the original 128K Macintosh computer. Programs for the original Mac had to be developed on a Lisa. If there is ever an iPad that has self-programming capabilities; it will probably be called the iPad Pro. There!!! I said it. Did I just start a rumor? That was easy!